Schwartz & Wade, 9780449817445, 40pp. Laurie Ann Thompson is the author of Be a Changemaker: How to Start Something That Matters, a how-to guide for teens who want to change the world. An advocate for social justice, Laurie is dedicated to inspiring and empowering young readers. 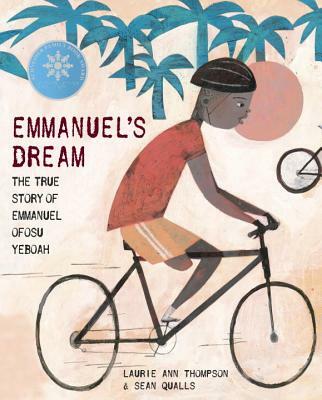 Emmanuel's Dream is her picture-book debut. Visit her at lauriethompson.com. Sean Qualls has illustrated many highly acclaimed children's books, including Giant Steps to Change the World by Spike Lee and Tonya Lewis Lee, Lullaby by Langston Hughes, and Before John Was a Jazz Giant by Carole Boston Weatherford, which was named a Coretta Scott King Illustrator Honor Book. Sean also created the art for Dizzy by Jonah Winter, which received five starred reviews, and Freedom Song by Sally M. Walker. Learn more at seanqualls.com. "...[S]imple line drawings and stylish, expressive figures filled with layers of rich, warm color on pale, thickly painted backgrounds—capture Emmanuel’s triumphs beautifully." "Thompson...presents a warm, matter-of-fact overview of the life of Emmanuel Ofofu Yeboah...[while] Qualls provides solid visual and emotional scaffolding for the setbacks and triumphs Yeboah faced." "This powerful and winning picture book tells the story of a young man overcoming the odds."